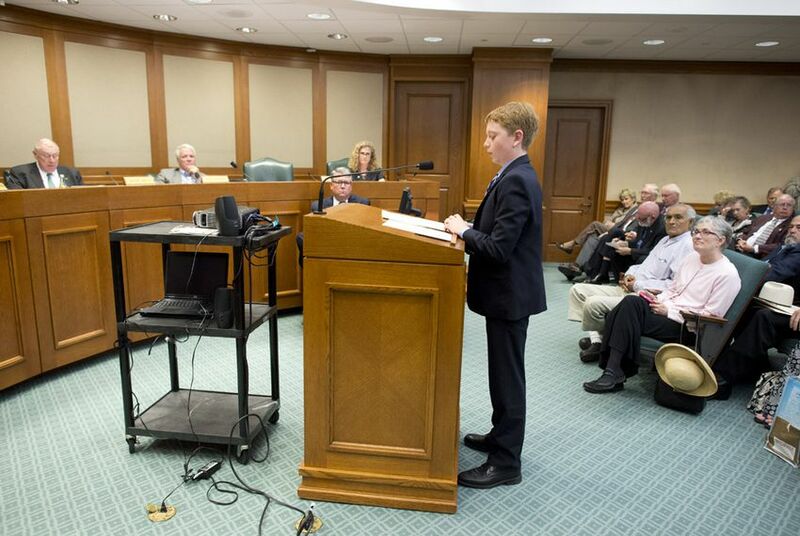 One hundred and fifty years after the end of the Civil War, a 13-year-old boy caused an uproar at the Texas Capitol on Tuesday as lawmakers considered his proposal to modify a state holiday honoring Confederate heroes. One hundred and fifty years after the end of the Civil War, a 13-year-old boy caused an uproar at the Texas Capitol on Tuesday as lawmakers considered his proposal to change a state holiday honoring Confederate heroes. “This is to move into an era that is more inclusive,” Howard told the House Committee on Culture, Tourism and Recreation. But a long list of opponents stayed late into the afternoon to testify against Hale's suggestion, offering emotional accounts of their Confederate ancestors, noting Texas' overwhelming support for the South in the Civil War, and denouncing the bill as a politically motivated attempt to dilute and rewrite history. In addition to changing its name, the legislation would shift the state holiday from Jan. 19 – Robert E. Lee's birthday – to the second Monday in May to avoid occasional conflicts with Martin Luther King Jr. Day. A companion bill, SB 870, has been filed by state Sen. Rodney Ellis, D-Houston. In a sharp blue suit and with a tuft of red hair, Jacob took to the podium to explain that in studying the role of Texas in the Civil War, he realized that Confederate Heroes Day was not representative of all positions or events. "Many Texans were killed for having pro-Union sentiments," Hale said, shuffling his prepared statement. "This is neither accurate nor placed accurately on the calendar." But many of those who testified used their time to clarify what they consider clear evidence that Texas was always a Confederate state. Rudy Roy, a member of the Sons of Confederate Veterans from Palestine, Texas, pointed out that 32 counties in Texas are named after confederate soldiers. "If we start trying to change the historical record for political reasons, we do great damage to our heritage," said Roy. "I'm sorry to say it this way, but we were not a Yankee state!" At moments, the debate became tense and personal. Questioning Roy, Democratic Rep. Marisa Marquez said that history is about perspective. "People ask me what part of Mexico are you from?" she said. "And I say the part currently occupied by the United States, El Paso. That's also part of our history." Rep. Ryan Guillen, D-Rio Grande City, the committee's chairman, had to remind the crowd that outbursts would not be tolerated. When Howard, in response to criticism, insisted that the bill was not about political correctness or erasing history, she was mocked by audience members. Those who signed up to testify overwhelmingly opposed the bill, some saying Hale was too young or naïve to understand the impacts of what he was proposing. But others commended Hale for bringing this debate to the table. "I want to commend you, and I don't want you to be affected by the comments you're hearing here today," Marquez said after stopping the hearing to tell Hale that he had done a good job. The unease surrounding symbols of the Confederacy is no stranger to Texas. The University of Texas has been embroiled in a decades-long conflict about a campus statue honoring Confederate President Jefferson Davis. It has long been a target of vandalism, and, more recently, the student government passed a resolution calling for its removal. The U.S. Supreme Court is currently hearing a case that unleashed a national debate in 2009, when the Texas Department of Motor Vehicles denied the Sons of Confederate Veterans' application for specialty license plate bearing the Confederate flag. "This is not a bill I was seeking, and I discouraged him at first," said Howard. "He convinced me that it was an important thing to do, and after the debate we had today, I am certain that it is the right thing to do." Howard explained to Hale that the bill would not only be unlikely to see a vote Tuesday night, but might not see a vote at all, given how controversial the issue remains. "I didn't even know what a committee was before I came," Hale said after the hearing. "The legislative process is pretty cool, but it would be hard for me to do this for very long."